EASTON, PA--(Marketwired - February 26, 2016) - Famous Smoke Shop, the leading online distributor of discounted premium cigars, specializing in offering the web's widest selection of cigars at the lowest prices is a huge supporter of the U.S military and the Cigar for Warriors Foundation. 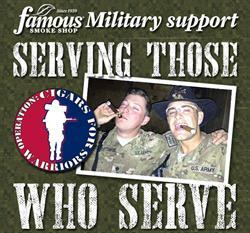 Famous Smoke has once again offered their monthly donation to Operation: Cigars for Warriors. February's total cigar shipment came to a total of 2,840 cigars to our men and women of the military to enjoy while they help protect our freedoms. Operation: Cigars for Warriors is a wonderful non-profit organization which sends our U.S. troops cigars to help them relax when not in the comforts of their own homes, or country for that matter. According to their Cigars for Warriors website: "This mission that we have taken up is one of great importance as we know that some of these fine men and women would not be able to enjoy well-deserved moments of reassurance and relaxation without the generosity of sponsors and individual donors." Cigar for Warriors recently mentioned through social media that, "USPS raised the shipping rate by $0.60. 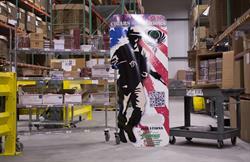 Although that might not seem much, Cigars for Warriors ships out thousands of Care Packages a year." Please consider a tax deductible donation to help them cover these increased shipping costs. Click here Donations are greatly appreciated. One of the military recipients of these cigar donations stated "I just received my Cigars today I was not expecting so many. I have to get a bigger box! We will be smoking joking and taking pictures very soon and we all really appreciate the care package that cutter the matches and lighting sticks will definitely come in handy." Operation: Cigars for Warriors also indicate on their mission page: "It is our way to honor, show respect and thank those putting it all on the line for us back home. We have received requests from many soldiers who have no one here in the U.S. to send care packages to them, and would otherwise receive nothing. Just as every warrior matters, so does every cigar." February's cigar donation for 2016 to this amazing cause bring our yearly total of cigars donated to over 6,700. Famous Smoke Shop has been a proud supporter of Cigars for Warriors for many years. With support from fantastic customers they have been able to reach a huge milestone with over 100,000 cigars donated since inception. Viewable online here. People interested in learning more about Famous Smoke Shop, and Operation: Cigars for Warriors, or donating cigars to our men and women in uniform should visit Famous Smoke Shop online or call 800-564-2486. Famous Smoke Shop is the nation's #1 discount retailer of premium cigars online, offering one of the largest selections of handmade cigars, machine-made cigars, cigar humidors and accessories. Famous offers the web's lowest prices on a wide selection of cigar brands including Drew Estate, Davidoff, Macanudo, Oliva, Perdomo, and many more. Famous offers customers the best prices on all premium cigars as well as friendly and knowledgeable customer service.